CRSS-C common rail injector test bench is based on the diesel engine ECU, also provides control signal of common rail system of Bosch, Denso, Delphi and Siemens etc. 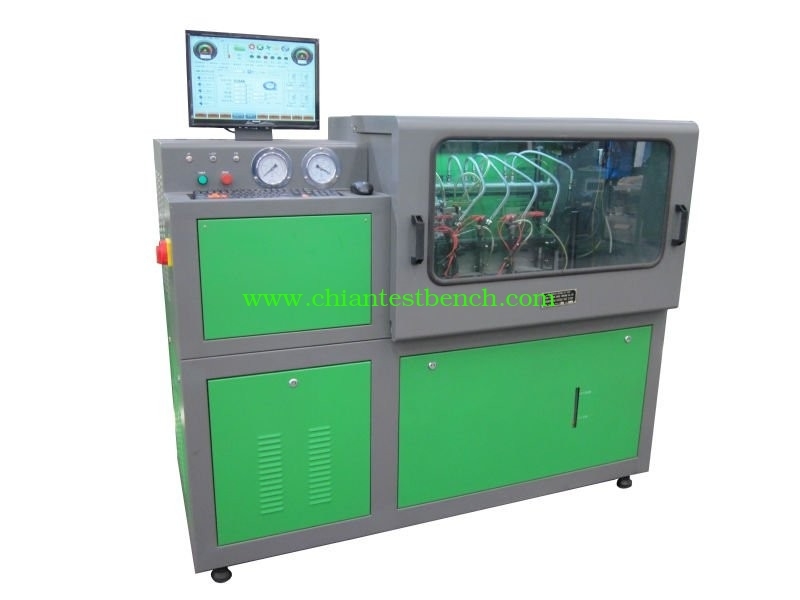 (the CP1 /CP2 /CP3/ HP3 /HP4 / DELPHI), drive the high pressure common rail injector to work. The user can set parameters according to their actual situation, and save the data according to the different group, so that the servicemen do the correct judgment and maintain of the working of common rail system. 1. Test the high-pressure injection performance of common rail pump. 2. Test low-pressure transfer pumps performance of common rail pump. 3. Test fuel rail pressure sensor performance. 4. Test fuel rail limited pressure relief valve performance. 5. Test fuel rail flux limit device performance. 6. Measurement of the fuel delivery of common-rail injector. 7. Measurement of the reflux delivery of common-rail fuel injector. 8. Test the measurement consistency of common rail injector. 9. Test the degree of atomization of common rail injector. 10. Test the sealing of common rail injector. 11. Motor soft start, frequency-changing and speed-regulation. 12. The oil rail pressure can be set. 13. At the same time drives the work of six injectors. 14. LCD display the testing oil rail pressure in real-time. 15. Various language available, such as Chinese, English. 16. Pulse and freqency of the injector drive signal can be adjusted. 17. The testing of open-loop and close-loop can be controlled from controller. 18. Provide safety protection design, use more safety. 19. There are the database of common rail fuel pump and injector.